The game type is selected from the drop-down menu in the New Game Window. The selected game-type initial appears in the game list when the game offer is posted. When you create a demonstration board from the New Game window it can be edited immediately. Demonstration games are useful for showing a problem or setting up an example game. Other players can watch, and you can let others edit the board as well. The other way to make a demonstration game is after playing a normal game you can review it by clicking Options --> Review Game. This will make a new demonstration game initialized to the final board position in which you, your opponent, and other observers can play and discuss variations. The original game remains in your game list unaltered. For more information on KGS's extensive reviewing features see Reviewing Games. 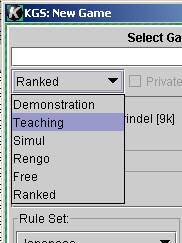 Like all game types, excepting Ranked, you can make the Demo private by clicking the Private check box. More information on using this option is here. In a teaching game, the player with white has the ability to stop the game, make annotations, try variations, and restart the game. See Tools for Demos, Teaching, and Review for more information. Unlike other game types, in a teaching game, players can see comments that observers make about the game while it progresses. The chat line in a teaching game can be supplemented with audio if the teacher has a Teaching Account. A teaching game has no effect on ratings. In a simul game a player accept challenges from multiple opponents simultaneously. This is one of two special game types on KGS. Simul games do not count towards ratings. Rengo is the other special game type available on KGS. This game is special in that there are four players instead of two. Two players are assigned to each color (two for black, and two for white) The players alternate their turns accordingly. (first black player, first white player, second black player and second white player, and so on). Comments from observers cannot be seen by the players. Rengo games do not count towards ratings. A free game has no effect on ratings. A free game is good for casual play between rated players, and for play of rated players against guests and non-rated players. As with rated games, the players cannot see comments made by observers until the game is concluded, and neither can players edit the game until it has ended. A ranked game counts towards players' ratings. Both players must be registered accounts and not guests, the game must be on a 19×19 board, and the handicap must be six stones or less. Pro accounts can not play rated games on KGS. In general, a game must have at least 10 moves before it is saved by KGS and used by the rating system, however, a ranked game with even less than 10 moves WILL count if it is saved by the person who plays as white. Automatch games are automatically saved regardless. All ranked automatch games are used by the rating system. In both rated and free games, players cannot see comments made by observers until it has ended, and players cannot edit the game until the game is over. A "rated game" is the same thing as a "ranked game". There are other game initials that are not on the drop-down menu in the New Game window. If the Private checkbox on the game-offer page is checked, then the "P" game-initial appears in the game list. Private games can not be ranked. All games played in under the KGS Tournament System are displayed with a star. See also KGS Tournaments Page. The KGS Plus events, that only KGS Plus members can attend to, are displayed with a +. See also KGS Plus Page. Your rating is a decimal number, your rank is an integer. Ranks are limited to 9d. Ratings have no limit. The history of your rating and or of your rank is displayed in your rank graph. A "rated game" is the same thing as a "ranked game".